According to TeenSafe, in 2016, 87% of today’s youth have witnessed cyberbullying while 34% personally experienced cyberbullying. Among the surveyed students, 15% have admitted to cyberbullying others, while 24% said they did not know what to do if they would be harassed online. Most commonly reported types of cyberbullying includes spreading rumours and experiencing hurtful comments based on physical looks, race, religion, and sexuality in social media platforms. Negative impact on the victim, such as low self-esteem, development of self-harming behaviours, and suicidal thoughts, follows the experience of cyberbullying. #DigCit – Why it Matters? Cyberbullying is just one of the many unfortunate and unnecessary ill-effects of the proliferation of technology tools. Some sees tech tools, such the iPad, Internet, mobile phones, and social media platforms, as the source of these problems and so, reactively remove or ban them in school or classroom premises. While there might be valid reasons behind these courses of actions, empowering students, parents, teachers, and everyone in the school community with the necessary digital skills is the more proactive and essential answer to these unending issues and challenges. This is why digital citizenship matters! In simple terms, digital citizenship is the norms of appropriate and responsible use of technology. In school setting, digital citizenship covers concepts and skills that teachers, technology leaders, school administrators, and parents should teach and develop in students or technology users for them to use technology tools appropriately. Digital citizenship covers areas such digital security, literacy, rights, use, and digital-emotional intelligence among others. The importance of digital citizenship makes it a necessary area to be included in a school or district’s technology program framework. It is not enough to focus on ensuring that the physical infrastructure is ready or that the whole school or district is wired or has purchased the necessary devices. It is not enough to train teachers or staff about the pedagogical and technical aspect of teaching with tech in the classroom. Teachers should also be armed with the skill to direct students to use technology properly. Digital citizenship is not external to the student’s experience in a technology-rich learning environment. It is an integral part of it. How to Promote Digital Citizenship? Digital citizenship should be embedded in every tech-integrated lesson or learning activity. For example, when students are taught to research or gather information about a certain topic from the Internet, they should know how to properly search for information, credit authors properly, or even to critically evaluate their sources. When students are taught to collaborate online, they must know the proper way or the accepted and expected behaviour in sharing, listening, accepting or disagreeing with the opinions of other people. When students are taught to share their learnings to the public audience via the Internet, then they must also know how to protect the private aspect of their lives. Involve parents in the digital citizenship program of the school. After school, students spend the rest of their time at home. Sometimes, they are even left alone with their mobile devices. During these unguarded moments, any form of cyber attack or cyber danger can pop out in front of the learner. Involving parents and discussing with them the importance of and the different ways to promote digital citizenship even at home can support the school’s program. The partnership between schools and parents solidifies and reinforces the program in all aspects. Design meaningful and effective digital citizenship program that caters to the student’s context/ needs and is a product of school community collaboration. There are numerous online resources which can help teachers or schools draft their own digital citizenship program. Sites such as Common Sense Media and Google for Education have excellent resources for embedding digital citizenship in daily classroom encounters. However, the most important aspect of creating and implementing a digital citizenship program is to really involve every member of the school community so that all areas will be covered. Getting contributions from each member of the community gives the message that every one’s idea is important and vital to the framework. Model digital citizenship. Students shouldn’t only be the ones who are practicing digital citizenship. Teachers and parents should also be role models to effectively develop digital citizenship skills among learners. Ed Tech integration in education has been a major factor or catalyst in driving 21st century learning forward. When done meaningfully, student learning is propelled into greater heights, adding the needed rocket boost to engage all kinds of learners and to enable learning environments that welcome risk-taking, innovation, and creativity. However, tech integration can also be a source disappointment or frustration to both learners and teachers if tech tools are used in class for technology’s sake, out of fad, or worst, disconnected from the pedagogy. As I often remind teachers in my talks, tech tools, alone, cannot create magic in class. Where is the magic then? It is with the teacher inside the classroom. However, in order for students to meaningfully used technology tools in class, teachers must be trained to design effective and relevant learning activities that would allow for better learning with tech tools. So, teachers attend workshops, trainings, and conferences, learning new apps and skills that can help change the way they teach various minds in the classroom. Yet, tech tools often change fast. App update notifications flood our mobile devices. New features our added to devices. With these changes come the obvious need to always make sure that teachers are updated with the skills (or app features) needed in the classroom. How do we then sustain relevant learning or growth in our teachers, who may realistically reach that saturation point where they just realize that there is too much to learn about tech integration? Teachers attend numerous Ed Tech related PDs, whether in-school or in large-scale conferences. In these PD opportunities, the attendees join mostly one-shot workshops or seminars, often depending on the expertise or topics that will be discussed or shared by the speaker. All the attendees are seen as a single homogenous group, putting and squeezing them into a one-size-fits-all experience. With the usual PDs, there is this traditional setup that is often experienced, such as when the seminars or workshops are too much speaker-centered and the participants are out there feeling bored or just listening to the “updates” or theories. More often, professional development sessions are often created by experts or other people that hope to “develop” teachers. To be fair, however, professional development for Ed Tech integration has seen some major changes. For one, an Ed Tech PD should never just be about ideas or theories. A big chunk of it should involve hands on, practical, and experiential learning. Yet, without careful planning or considerations, PD trainings can be reduced into plain skills training that may often be disconnected from the needed skills in the classroom. So, what is the missing piece in this great puzzle of professional growth? It’s ownership of learning. This is where professional learning comes in. Today, professional learning experts and school leaders have recognized the importance of making Ed Tech trainings or workshops meaningful and relevant to the teachers. As adult learners, teachers find satisfaction and purpose if what they are learning is relevant to their context. Professional learning recognizes the individual contexts of each teacher – the needs, challenges, and goals. In short, teacher’s VOICE must be heard. Moreover, professional learning activities must be something authentic or applicable to their present situations because it is only when a teacher sees how a tech tool can work or improve instruction, assessment, or classroom management can he or she truly realize the importance of that professional learning activity. Let me share some of the practices or tips that I do as a professional development/ learning consultant and leader in our school. 1. Involve the participants in designing professional learning activities through getting pre-workshop data from the teachers. Pre-workshop surveys can help gather the needed data such as Ed Tech integration skills or tools that participants consider to be of top priority to be learned, practiced, or developed. The collected data can help decide which skills or apps should be included in the workshop sessions or trainings. 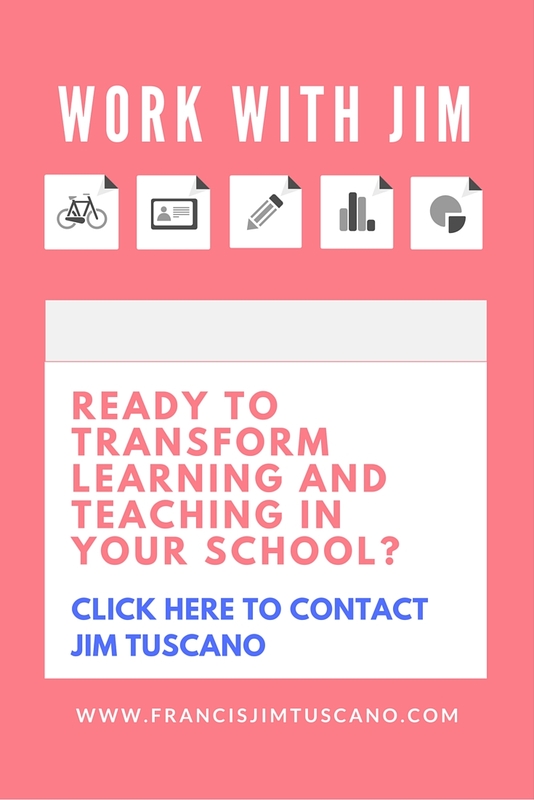 A professional learning leaders can also dig for more info such as technology skills level (basic or advanced) or teacher confidence that can further personalized the professional learning experiences. 2. Design various opportunities for professional learning to happen. Skills training is essential, but sometimes, some teachers may just need some realistic hands-on workshop where they can already practice and apply what they are currently learning. Some educators would seek for closer guidance through individual coaching. Some would just simply look for inspirations or assurance or validation to what they are doing. Avoid fitting all teachers into a single kind or format of learning activity. Consider their contexts and provide experiential, active, and collaborative learning. 3. Empower and involve the resident experts in the school. Ed Tech champions or experts are living proofs of how meaningful technology integration can improve teaching and learning. So, tap those who have experienced and improved much in their classrooms. 4. Consider giving dedicated and enough amount of time for professional learning. Most of the grumblings or complains of teachers about professional learning is not solely about how the workshops sessions or training were run themselves. Sometimes, it is simply because there is not enough time to acquire, reflect, and plan on how to apply those newly-learned skills. Hence, it is important that teachers may be given the needed space and time to incorporate and embed the newly learned tech tools and skills in their unit or lesson plans. 5. Tap the power of technology tools. Tight schedule, meetings, parent-teacher conferences, family life, and other commitments are already filling up the schedules of each teacher. Professional learning can happen even if the teacher is not going through a workshop or training. So why not take advantage of tech tools that can deliver bite-sized learnings or just-in-time kind of learning? Why not go beyond the school and connect with other experts via professional learning networks in social media such as Twitter or Google+ communities. 6. Sustain the professional learning of the teachers through providing support or individual coaching. Put in place a mentoring system so that expert teachers may continue to impart their expertise to those who may need their help or coaching. Create a culture of learning and collaboration through allowing teachers to share their learnings, mistakes, challenges, and solutions to each other. Just as much as our students deserve the best education, teachers, too, deserve high-quality professional learning. Remember, we, as teachers, can only impart what we have. Tech may change quickly, but our role as teachers still matter! Teachers, still, matter. So, keep on learning.